Maybe one day I’ll change my mind, eat my words, and embrace beautiful (and pricy!) organizational systems. Gallon size bags are my best organizational friend! 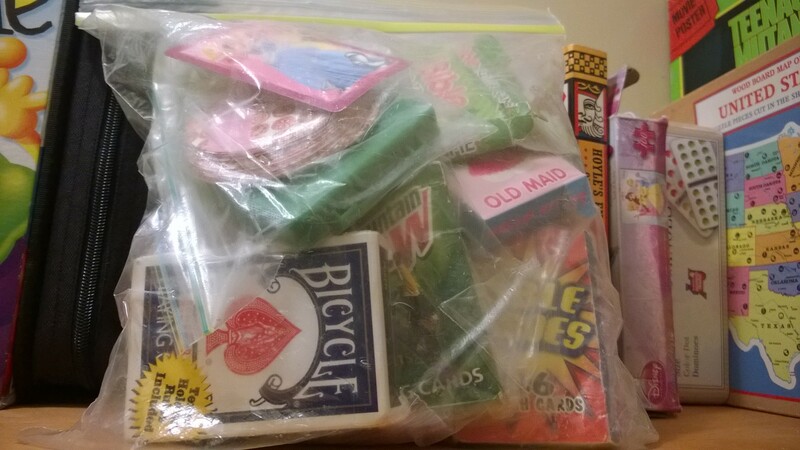 I’ve put decks of cards into sandwich bags then placed those in a gallon bag. We also keep small game pieces in sandwich-size bags in their respective boxes so they won’t get lost. Lily and Grace have a bag of headbands and bobby pins. 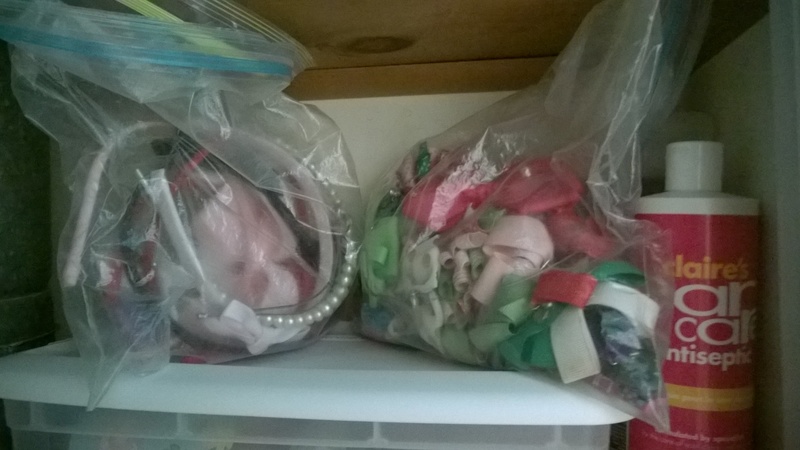 Another bag contains hair bows and barrettes. 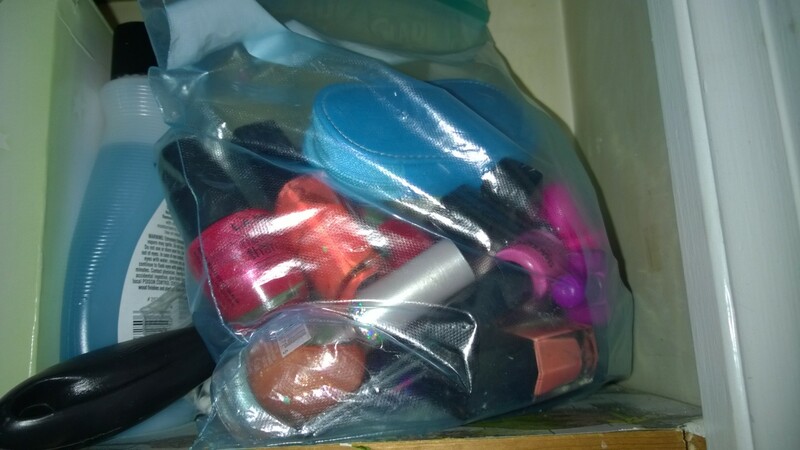 I have a gallon bag of nail polish. 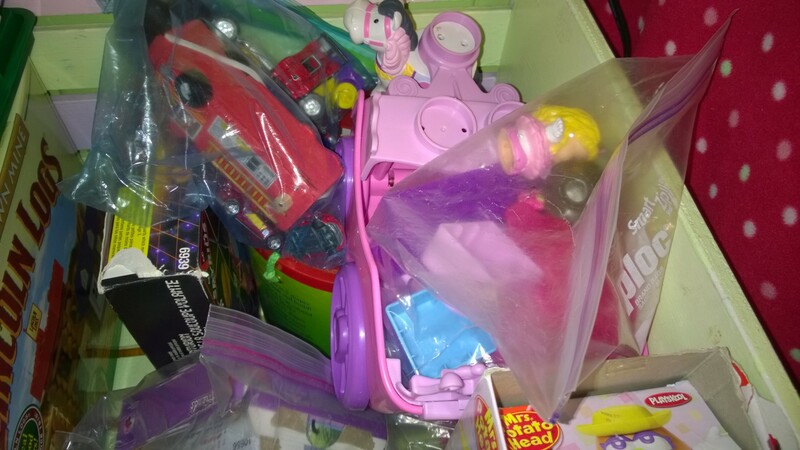 Grace’s toy box has like items in separate bags (cars, Lego’s, lacing games, etc.). We even use gallon bags for toiletry items and first aide supplies when we camp! A word of advice: I’m not usually a brand-snob but in this situation, I highly recommend that you “splurge” and buy Ziplock, or another good brand, bags. I’ve tried the off-brands and they’re not nearly as durable. I also love to organize with cardboard boxes! They definitely aren’t the prettiest storage containers. And if they’re used outside or in a cellar, it might be a problem. But in our home that stays dry enough? We haven’t had any problems with using boxes to store things. Holiday decorations, mementos, and clothes have all been successfully stored in cardboard boxes. 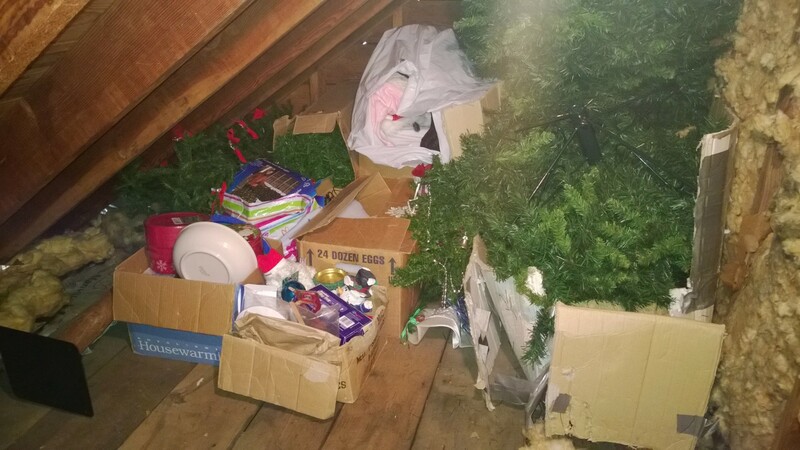 Christmas storage – out of the way and easily accessible! Sometimes I buy holiday presents early and store them away in gift bags. I also keep gift-wrap supplies in gift bags. 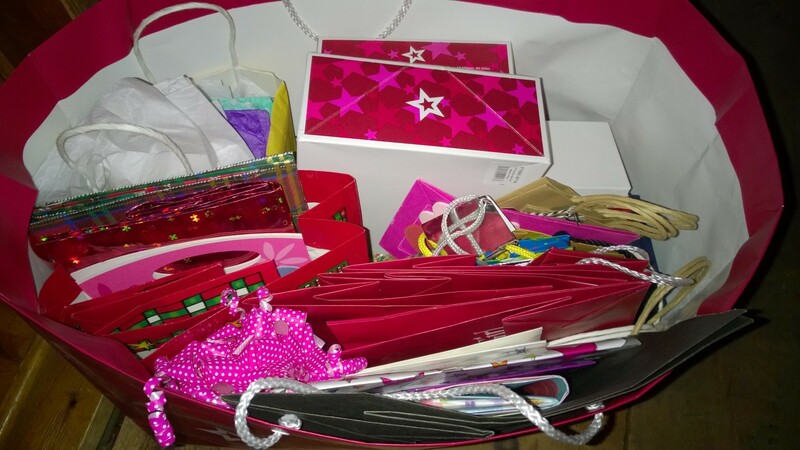 Tip: Gift bags are pretty for storing things, but stick with gallon bags and boxes for heavy items or things you’ll need to stack! We’ve been given items in adorable gift baskets so I use them around my home! 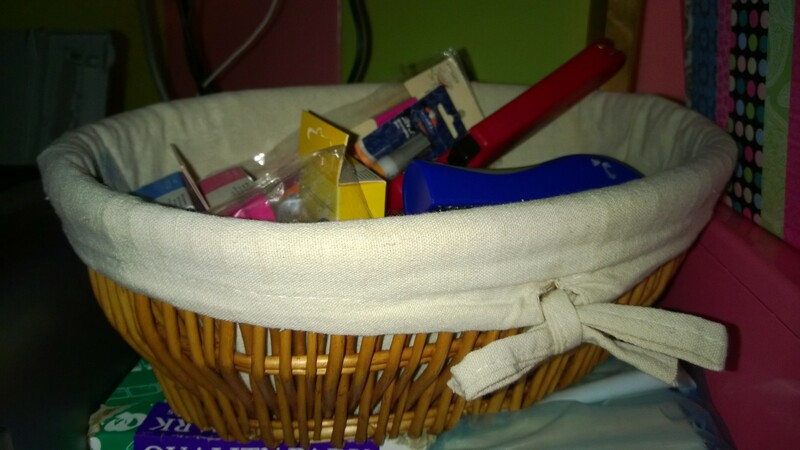 And I love the super cute basket I use to organize desk supplies. 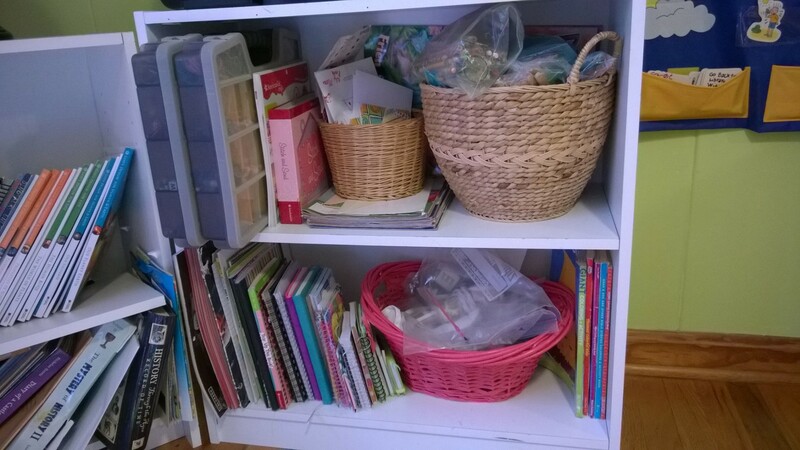 Baskets can also be used to hold blankets, magazines, photo albums, library books, and a plethora of other items! 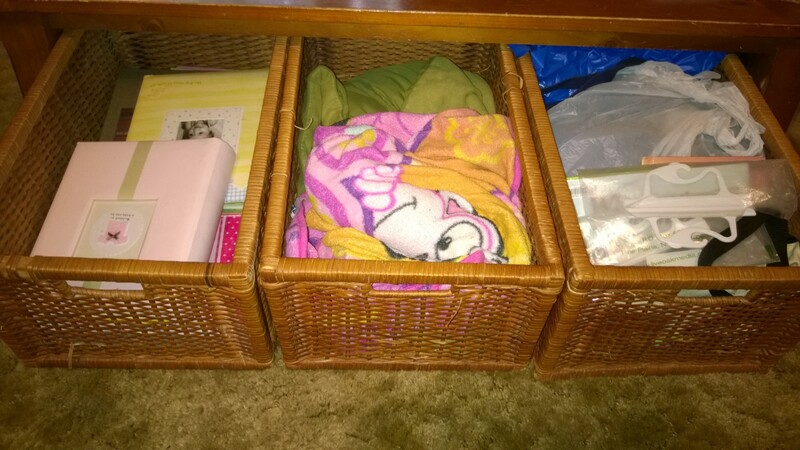 The baskets under our coffee table! From left to right: Photo albums, blankets, borrowed books. A few people have given us plastic containers they no longer needed. I use most of them to organize clothes and toys. 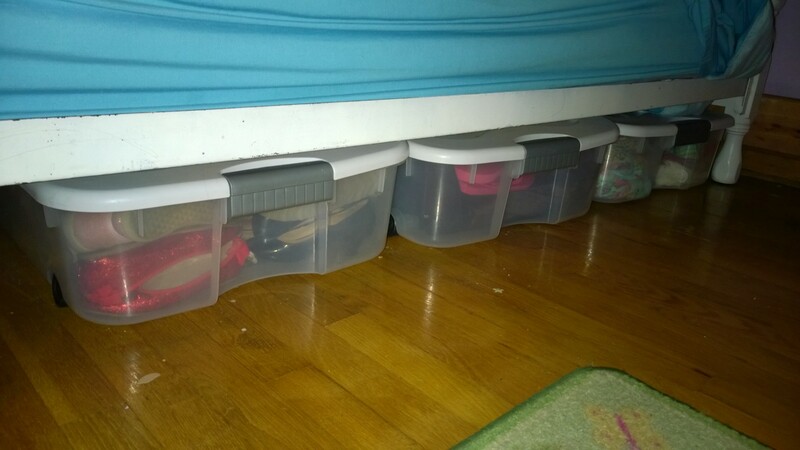 Under-the-bed totes for clothes to grow into. 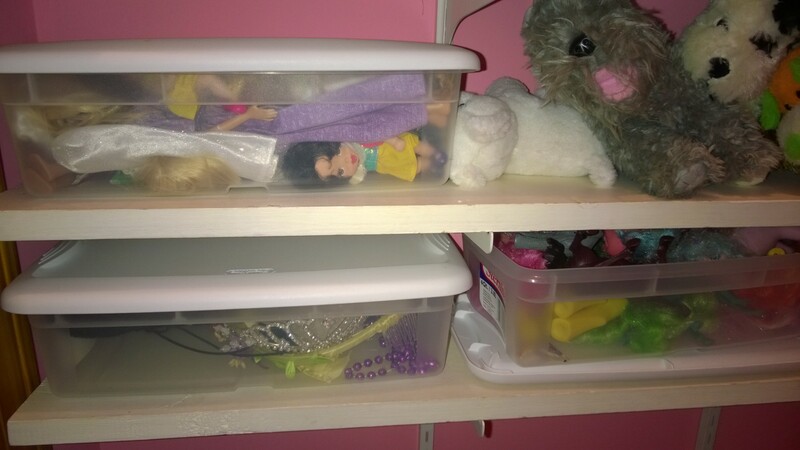 We have one container for ponies, another for dress-up accessories and another for small dolls. 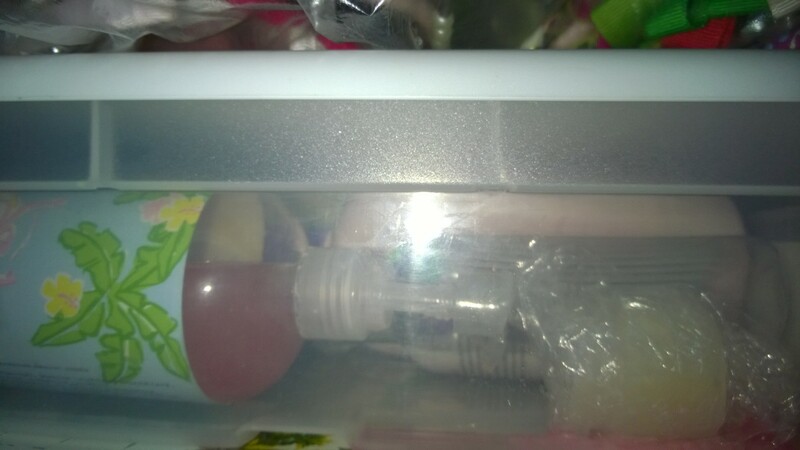 The girls each have a small spa container as well, complete with their bubble bath, extra sponges, etc. Bookshelves aren’t just for books! We have one bookshelf that only has art supplies on it. Bookshelves can also hold movies, games, and many other items! Art supply shelf. Notice the gallon bags inside the baskets! 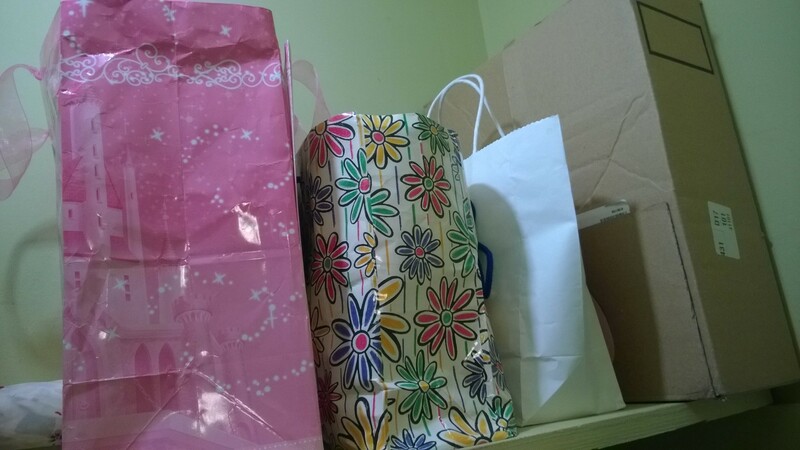 If you need to purchase a gift bag, consider buying an inexpensive container instead. My friend Alissa gave me a “writer’s inspiration” gift for Christmas one year and she put all of the items in an adorable box. I love it and keep all of my correspondence items (cards, envelopes, etc.) in it! Sometimes the problem isn’t a “lack of storage” issue as much as it’s a “too much stuff” issue. So when you’re implementing new organizational methods, go ahead and throw out what your family is no longer using! Whether you have cardboard boxes or beautiful bins, use storage containers you already have on hand to help set limits – once a container is full, it’s full, so something has to go. The less stuff there is, the more usable space you have! 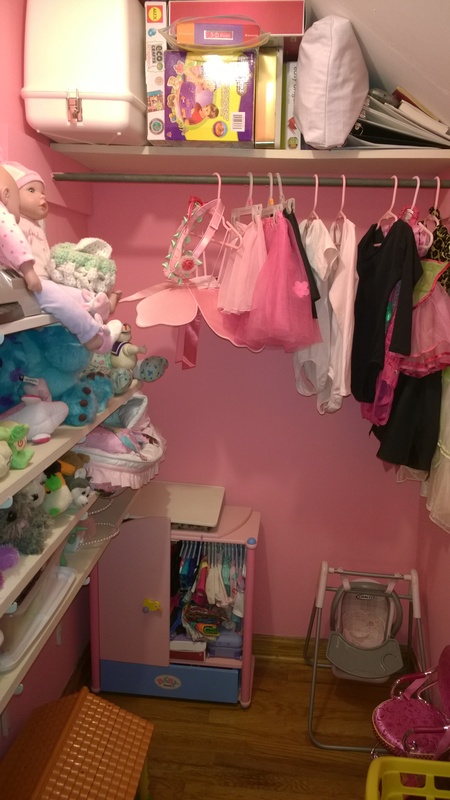 And when you look at the big picture (an organized home) as well as look at the space as a whole (an entire closet instead of focusing on one specific item), your organized spaces probably look nice even though various things aren’t in the prettiest containers. After-all, what looks nicer and is easier to use: an organized closet with a few gallon bags as storage containers or a closet that’s so disorganized, things fall out every time you open the door? Personally, I prefer the first option! What about you? What frugal storage solutions do you use in your home? 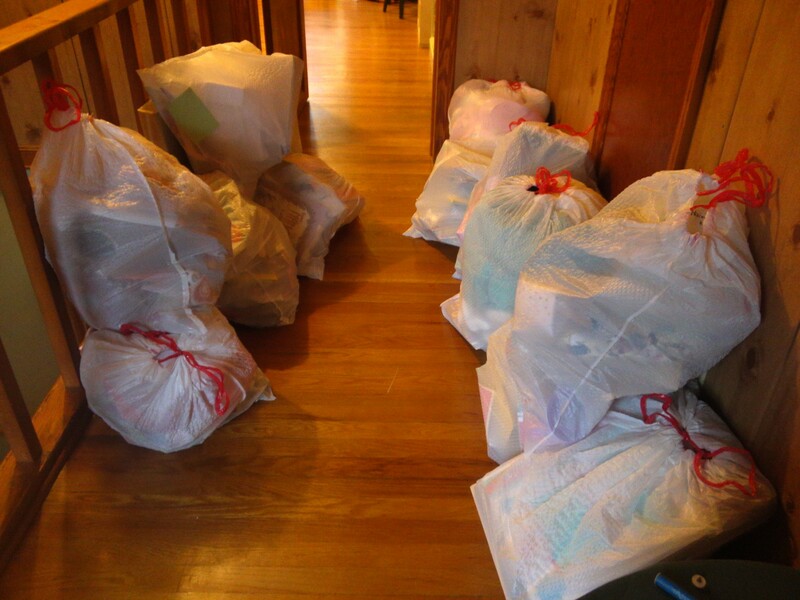 How I decluttered my entire house in just six days! Tips for keeping a clean-enough house when you’re really busy. Special Note: If you liked this article, then you’ll love my brand-new eBook, Chaos to Clutter-Free – go check it out! I didn’t know that – thanks for the great tip, Jill! 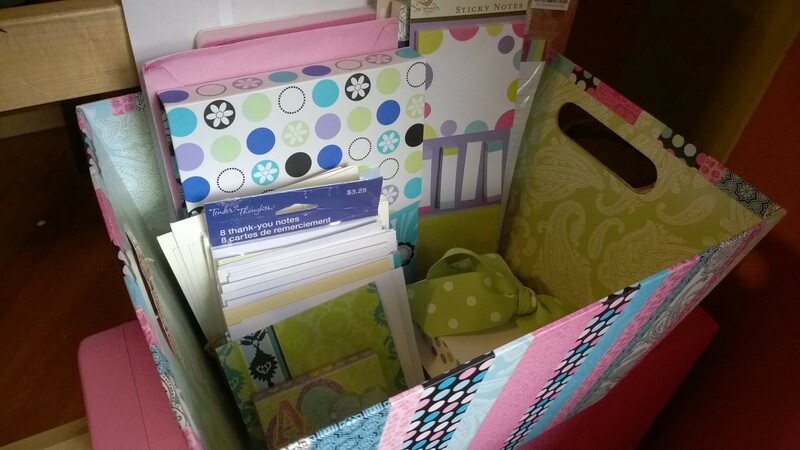 I wrap cardboard boxes in scrapbooking paper. It looks cute and it’s obviously much cheaper than decorative baskets. Very creative – thanks for sharing, Tina!